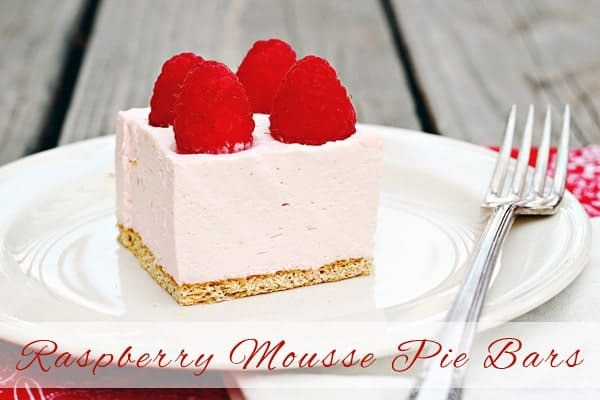 These raspberry mousse pie bars are absolutely amazing! The flavor and texture are just perfect–sweet, but not too sweet, and incredibly smooth and creamy. I really couldn’t get over how smooth and creamy the filling was. Making the seedless raspberry puree is the hardest part, and the extra bit of effort there is more than rewarded with a dessert that is almost too pretty to eat. Almost. Once you do start eating it, you may not be able to stop! And the gorgeous pink color makes it a perfect non-chocolate choice (because really, you should have options) for your Valentine’s Day dinner. Lightly spray a 9-inch square pan with cooking spray. Arrange graham crackers in an even layer in the pan, breaking or cutting them to fit. Place lemon juice in a small bowl and sprinkle with gelatin. Let sit until gelatin softens, about 3 minutes. In a blender, puree 2 cups raspberries until smooth. Pour puree through a fine-mesh sieve into a small bowl, pressing to extract all of the juices. Discard solids. You should have about 1 cup of puree remaining. In a small saucepan, combine raspberry puree and 1/2 cup sugar over medium heat. Cook until bubbles form at edge. Add gelatin mixture and cook, stirring constantly, just until gelatin dissolves, about 1 minute. Transfer mixture to a small bowl and let cool to room temperature, 20 minutes. In a large bowl, using an electric mixer, beat cream and 2 tablespoons sugar on medium-high until firm peaks form. With a rubber spatula, gently fold in raspberry puree mixture until combined. Pour over graham crackers. Smooth the top with an offset spatula. Arrange remaining raspberries on top. Refrigerate until set, about 2 hours or overnight. Oh now doesn’t that look great! Always inspired – thanks Danelle! 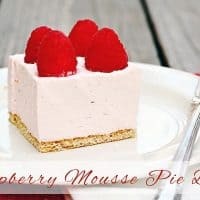 I love raspberry and mousse! This pie bar is amazing looking! So want to take a bite. What a beautiful looking dessert–can’t wait to try it. Thanks.